Like a rising sun, space shuttle Discovery rockets into the night sky on the STS-103 mission on Dec. 19, 1999 at 7:50 p.m. EST. The brilliant light creates a reflection of the launch in the water nearby. STS-103 was a servicing mission for the Hubble Space Telescope. 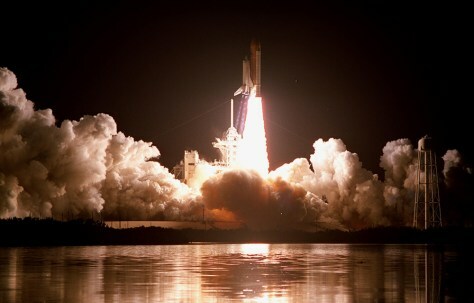 It was the 27th flight of Discovery and the 96th mission for the space shuttle program.